Last week we touched on using an automatic follow-up message beyond the initial Welcome message. 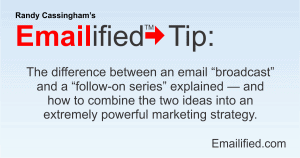 Let’s go a little deeper between a “broadcast” and a “follow-up” or “drip sequence” email series — both can be very valuable and, when used correctly, extremely powerful. My main email list is a weekly newsletter list. It’s my bread-and-butter business as an email publisher. People like the content, subscribe, and I create a new newsletter every week and queue it up to “broadcast” it to every subscriber each Friday evening. Once it’s sent out to everyone, it’s never sent again. Contrast that with a follow-on sequence: that’s one or more messages that are stored at your Email Service Provider (ESP) and that are automatically sent to subscribers according to the sequence and timing you set up. The obvious first example of that is a Welcome message, which is typically sent immediately upon the subscriber clicking on the confirmation link after they subscribe. Last week, I discussed my engagement message that helps set up two-way interaction with my new readers: the second in a “sequence” that’s sent when I specify — 24 hours after the Welcome message. But here’s where it can get really powerful: you can combine the two ideas. There is no limit to how many messages you can have in a sequence. So if, say, he goes through his article pile once a month and adds 4-6 new articles to the end, he can keep ahead and keep his audience involved and interested endlessly — and, by the way, they’re getting marketing for his books and courses every week endlessly too. But here’s the extremely powerful part: because these articles are both timeless and completely automated, when someone discovers his site and signs up for this list, he doesn’t have to do anything at all to address this audience: it’s completely automated because the sequence is already set up. In other words, if he has 150 articles set up in that series, someone can be on the list for about three years before they hit the end. Or, to look at that another way, he has three years to add something else to the end (say, another 50 or so articles) to keep those subscribers informed and marketed to for another year! See the power in that?! It’s huge! So depending on your business and how you want to market, your “newsletter” might not be something you write fresh every week: if your information is truly timeless, you can build them as one long (and ever-lengthening) sequence rather than using broadcasts. Or, indeed, doing both: sending out the timeless information as a follow-on series, and broadcasts for important “happening right now” events, such as a sale. I certainly could have set up Emailified that way, and the best part is, I can decide to do that later, if I want, because I’m building up a lot of valuable content. If this idea wasn’t powerful enough already, there’s more: you can have variable insert information too. Let’s say you want to market one of several books in your series of articles. If you wrote that marketing info into the actual message, and later wanted to promote a different book, or wanted to note your book had been updated, you’d have to edit every single message in the sequence with that new information. Ick. Better: use inserts. In AWeber (the ESP I use), they call them “Global Text Snippets”. You put the marketing information into a Snippet and use a coded link in the sequenced message to call up that Snippet. Then, if you want to promote a different book, or note that the book has been revised, you only have to edit the Snippet, and every message that calls that Snippet is automatically updated. Very efficient, and very powerful. A lot of businesses already have a bunch of short articles written that explain different aspects of their offerings. It’s just a matter of formatting them up into an email sequence and offering prospective customers the free resource. And as long as those messages are really adding value, you can certainly include marketing in the messages too, and a great way to do that is with variable inserts such as “Snippets”. The best part: it can all be totally automated. Now are you seeing the incredible power of email lists? !